Today is National Fluffernutter Day! Admittedly, before today, I’d never heard of this delicious PB&J alternative. But I thought I would give it a try, because ever since I learned how to make peanut butter fudge using marshmallow creme, I’ve been a big fan of the combination of peanut butter and marshmallow creme together. Marshmallow creme, which forms the basis of the fluffernutter sandwich, was first invented in Massachusetts in the early part of the 20th century. Sugar shortages due to war hindered its production for a time; however, the gooey treat never really fell off the radar. The fluffernutter (also known as the “Liberty sandwich”) was actually developed, and the first recipe for it was published, by marshmallow creme co-founder Emma Curtis during World War I (hence, obviously, the presence of “liberty” in the sandwich’s name). Emma Curtis was the great-great-great-granddaughter of Paul Revere. Because of its vast popularity and its rich local history, the fluffernutter has been named the “unofficial state sandwich” of Massachusetts, and real steps have been taken to make that title official. In 2006, the fluffernutter inspired some severe anti-junk food legislation in its home state when State Senator Jarrett Barrios found out his son was being served fluffernutters every day at school. The amendment limited the serving of fluffernutters at school to once a week. Fluffernutters aren’t just popular here on Earth. Astronaut Richard Michael Linnehan, who was born in Massachusetts and grew up in New Hampshire, enjoyed a fluffernutter while he was onboard the International Space Station. I guess, since I’m not from Massachusetts and don’t really know anyone who is, it’s understandable I’m not very familiar with the fluffernutter. Well, that is, I wasn’t familiar with it until I decided to make one for myself today to celebrate this delicious holiday. I made some modifications, though, to the traditional white bread, marshallow creme, and peanut butter sandwich. First of all, I didn’t have any white bread in the house, so I used wheat. And I’m such a PB&J fan, I just couldn’t bear the thought of substituting the jelly with marshmallow creme alone. So, I got the bright idea to add raisins (about half an ounce), since they are made from the same fruit grape jelly comes from. I was a bit skeptical at first, but it really was an excellent idea. 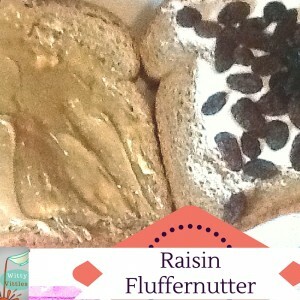 The raisins were amazing in this sandwich! And I got to feel a little bit better about my indulgence in the “unhealthy” sandwich my adding something healthier to it – well, in addition to the whole wheat bread. All in all, I’m glad I was introduced to the fluffernutter. It’s not going to be my go-to sandwich when I get a hankering for peanut butter. PB&J will always win out over the fluffernutter, as far as I’m concerned. But I can definitely see the appeal of this sandwich. And I love the many possibilities that exist in terms of fluffernutter variations. For example, I ran across several mentions of fluffernutter cookies. Also, in the process of researching this sandwich, I ran across this delicious cake recipe. I have not had a chance to make it yet, but I’m filing it away for later. It just looks too good to pass up! Now I want to know: What are your experiences with the fluffernutter? Do you prefer it over the PB&J, or is it the other way around? Talk back to me in the comments!